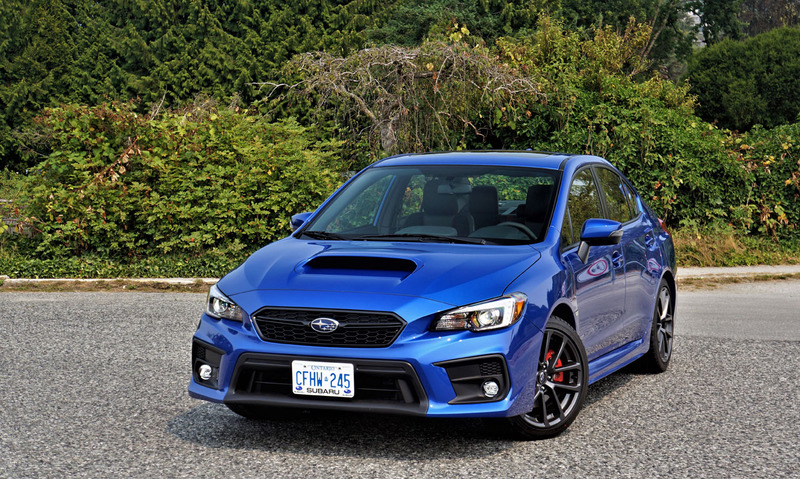 It only seems like we reviewed the 2018 WRX yesterday and all of a sudden the 2019 version is back in our garage, while once again our tester is equipped with its standard six-speed manual gearbox and gussied up in near top-line Sport-tech RS trim. 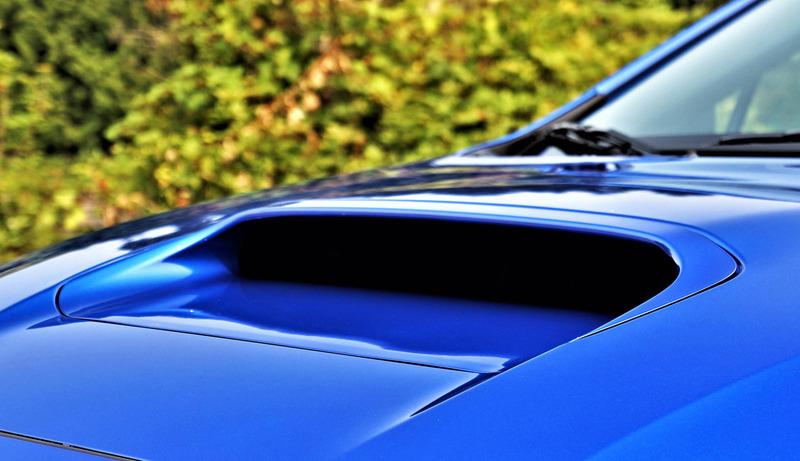 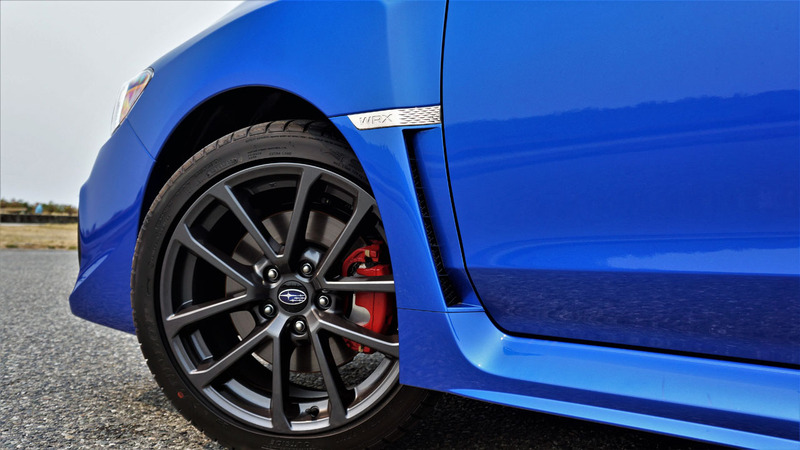 Subaru even doused its sheetmetal in the same World Rally Blue Pearl paint, a personal favourite for its vibrant hue as well as its historic motorsport pedigree. 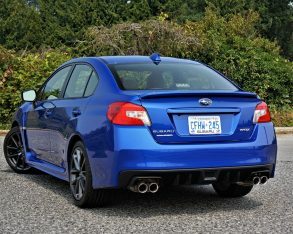 Why a near identical WRX within a year? 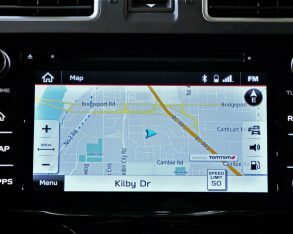 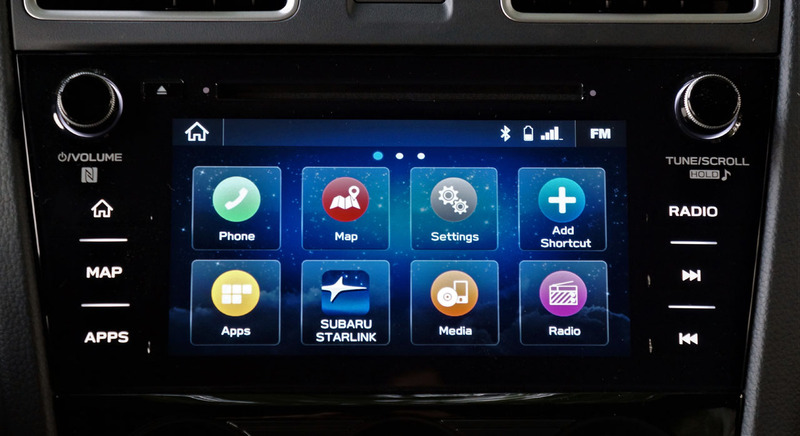 Because Subaru has changed up what is becoming one of the most important features in any new vehicle, its infotainment system. 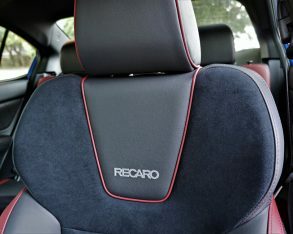 Most notable are completely new graphics that we think are much more attractive. 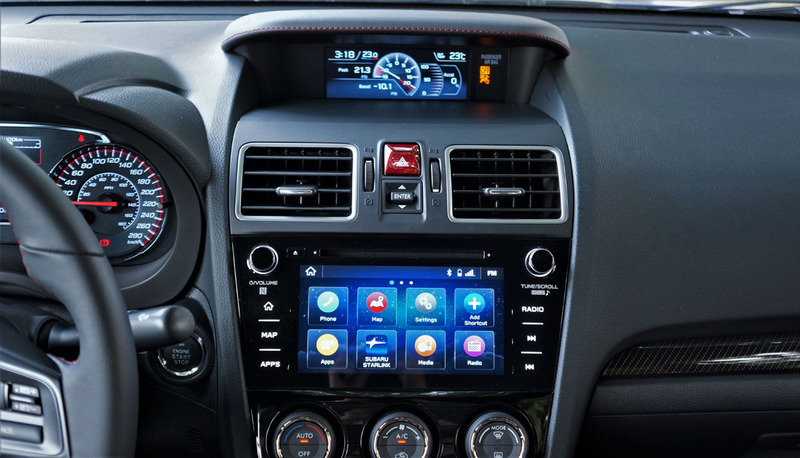 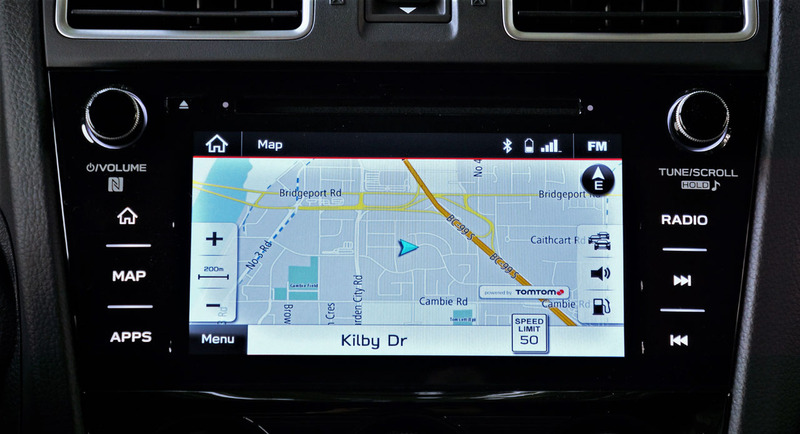 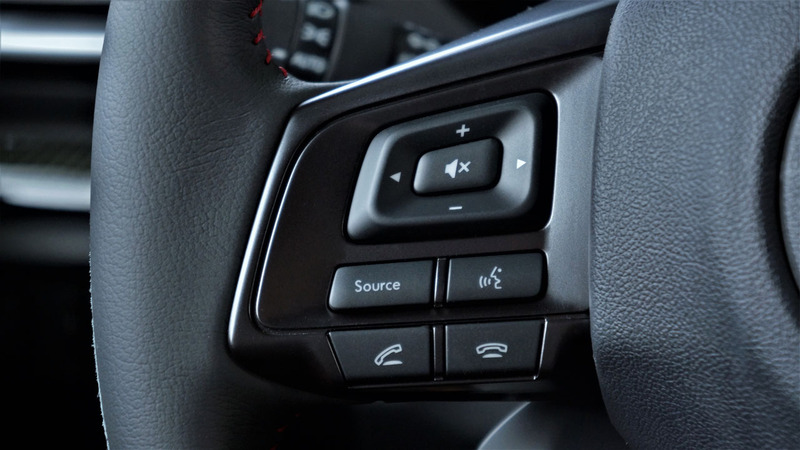 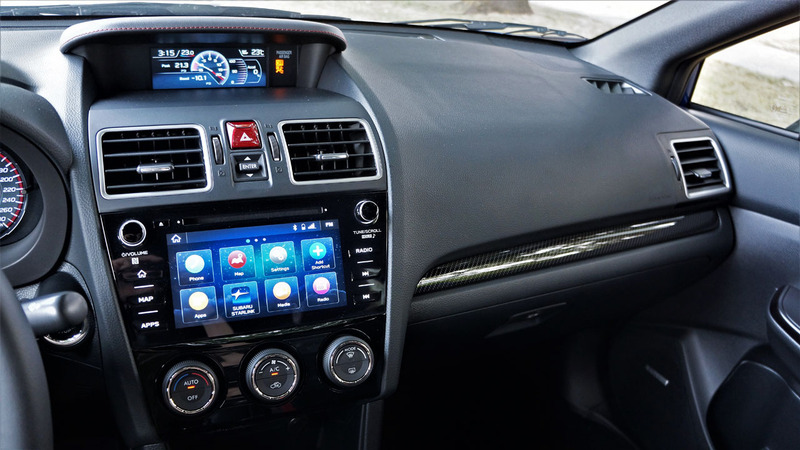 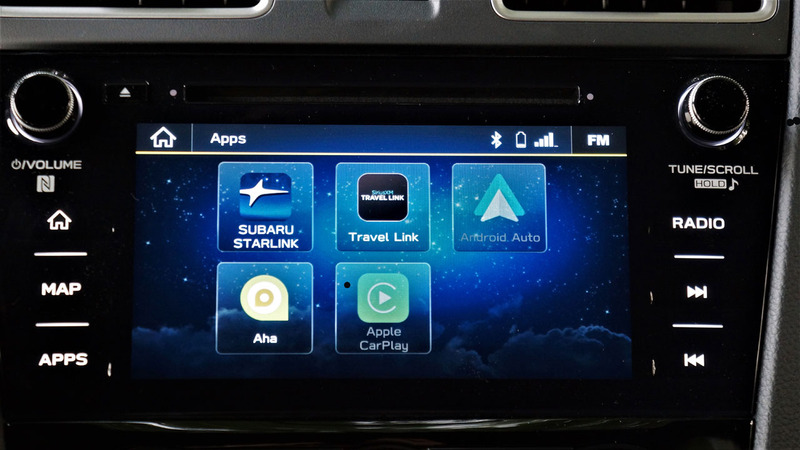 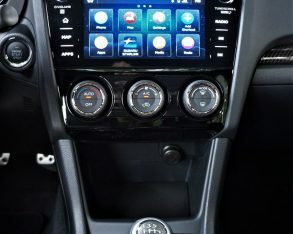 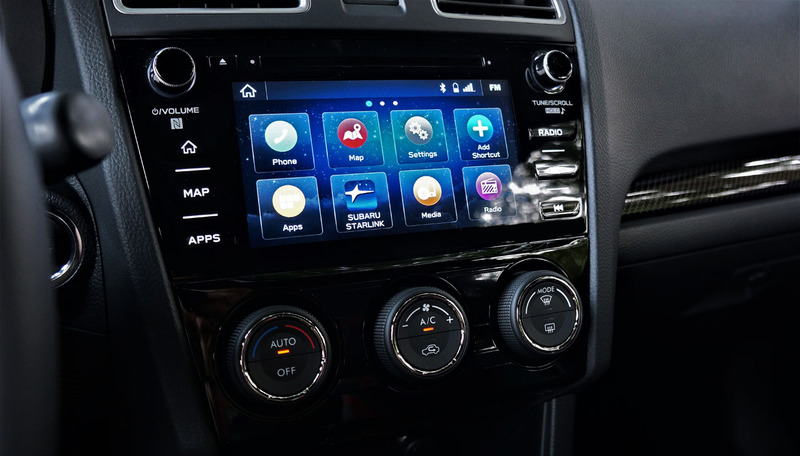 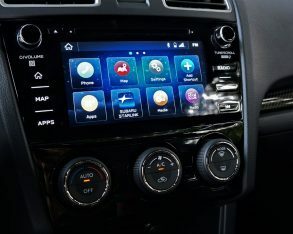 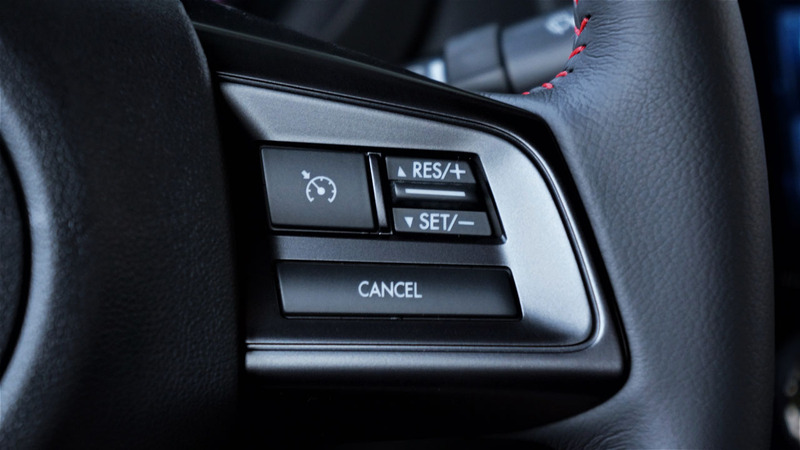 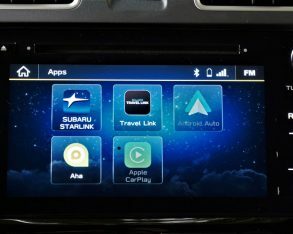 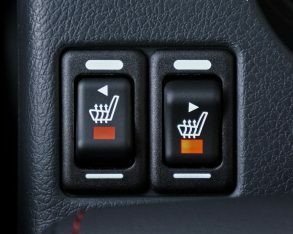 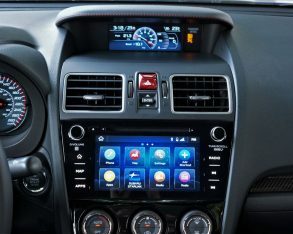 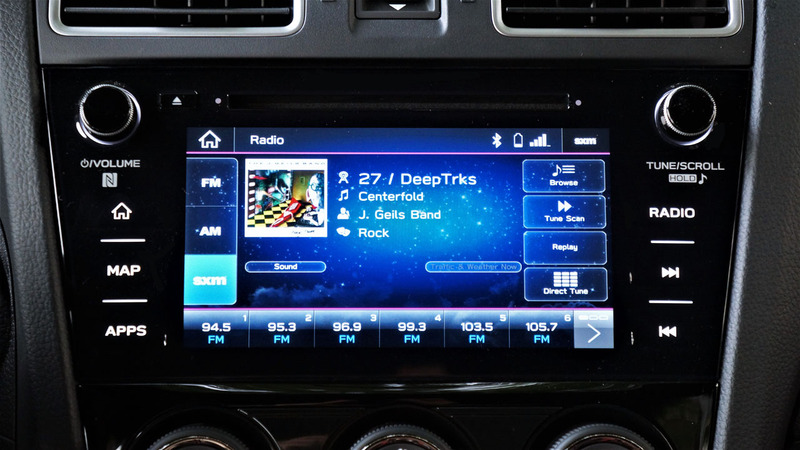 They’re highlighted by colourful smartphone/tablet-style candy drop digital buttons on a night sky-like blue 3D background, while Apple CarPlay and Android Auto phone integration are now part of both base and top-tier systems. 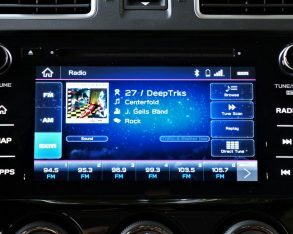 Our tester features the latter, the touchscreen still measuring 7.0 inches diagonally for a half-inch gain over the base display, and once again getting touch-sensitive quick access buttons down each side, which include Home, Map and Apps to the left and Info just above two sets of track seeking arrows on the right. 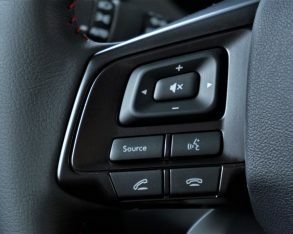 Of course, we’ll go into more detail as part of the forthcoming road test review, but suffice to say it also includes near-field communication (NFC) for faster phone connectivity, a Micro SD card slot, HD radio, new glossy black topped audio knobs, navigation, a rearview camera with dynamic guidelines, and more. 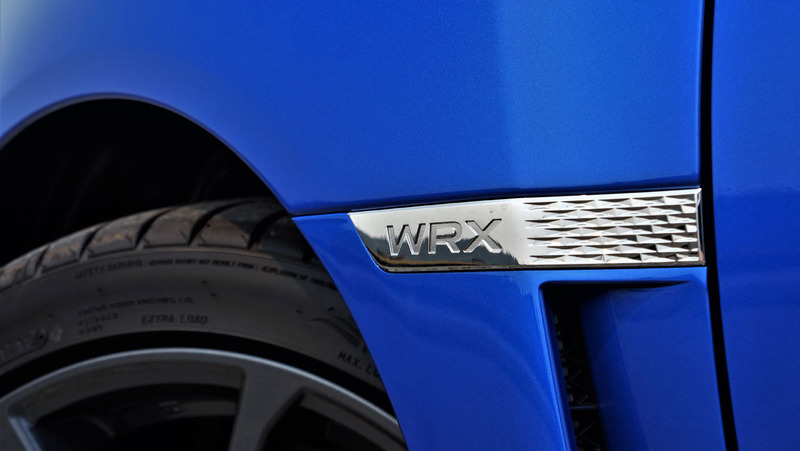 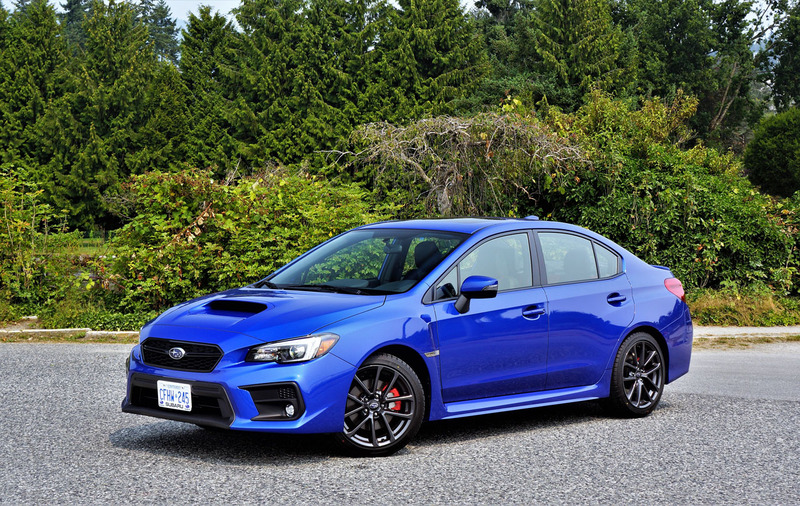 The rest of this WRX Sport-tech RS and its non-STI compatriots remain unchanged, which means it still features last year’s styling updates, chassis tweaks, and various refinements, not to mention its new safety features and single modified drivetrain component. 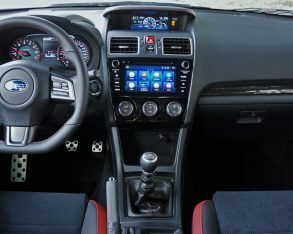 What are we talking about? 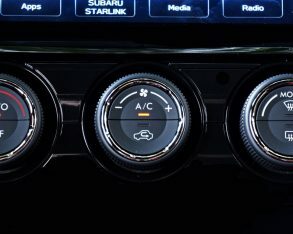 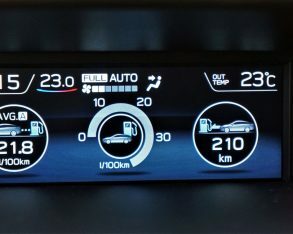 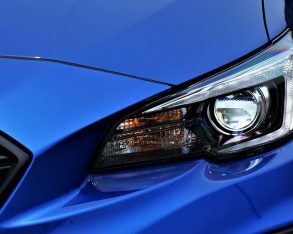 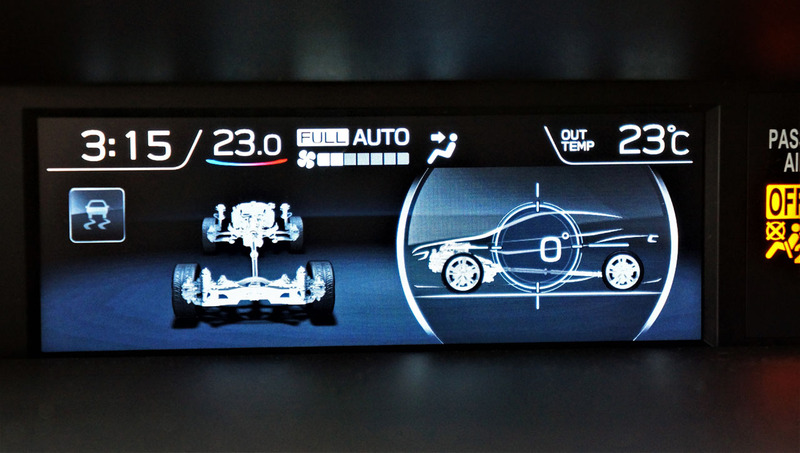 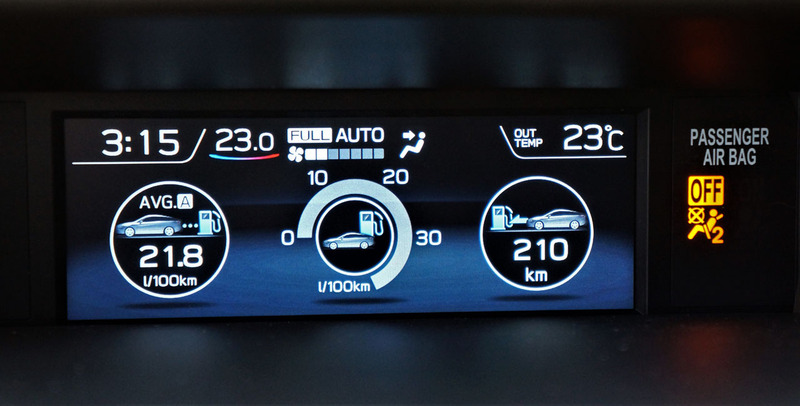 Last year Subaru reworked the front grille and bumper design, as well as the interior door trim, while the driver received a revised electroluminescent primary gauge cluster with a high-resolution colour TFT centre display. 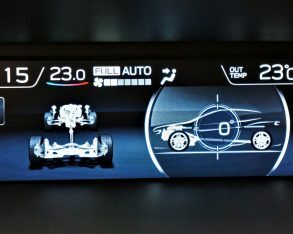 The 5.9-inch colour multi-information dash-top display got a graphics redo too, and it’s stunning. 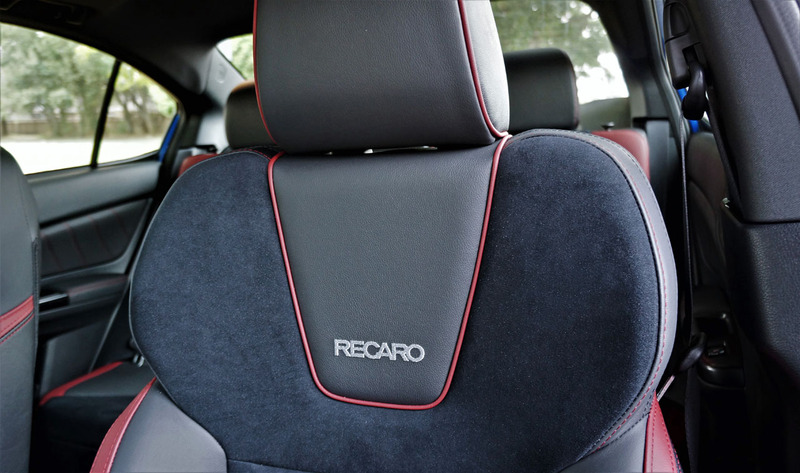 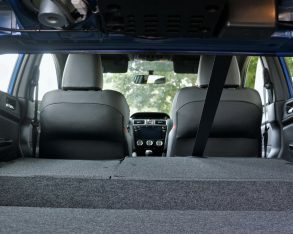 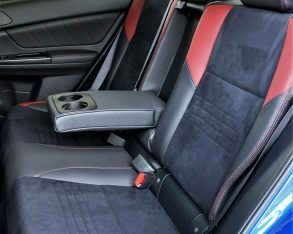 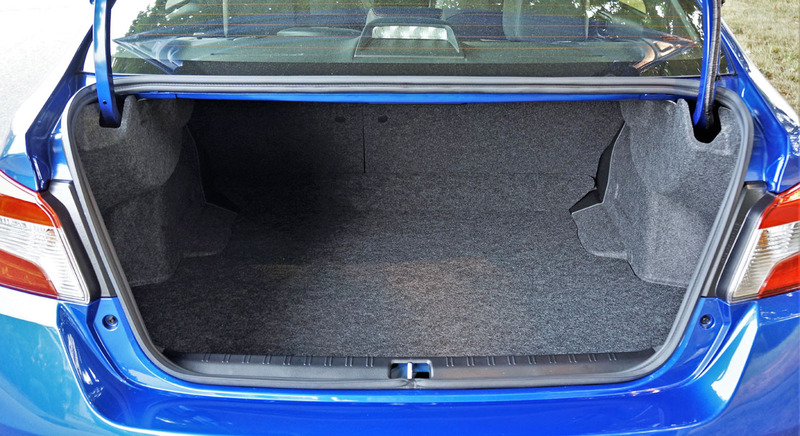 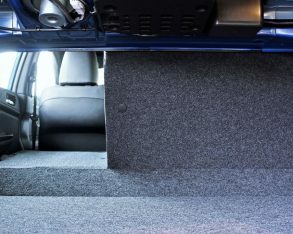 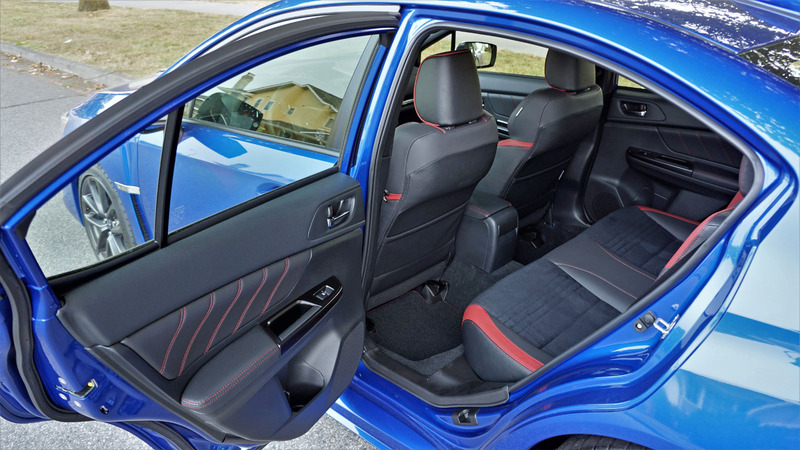 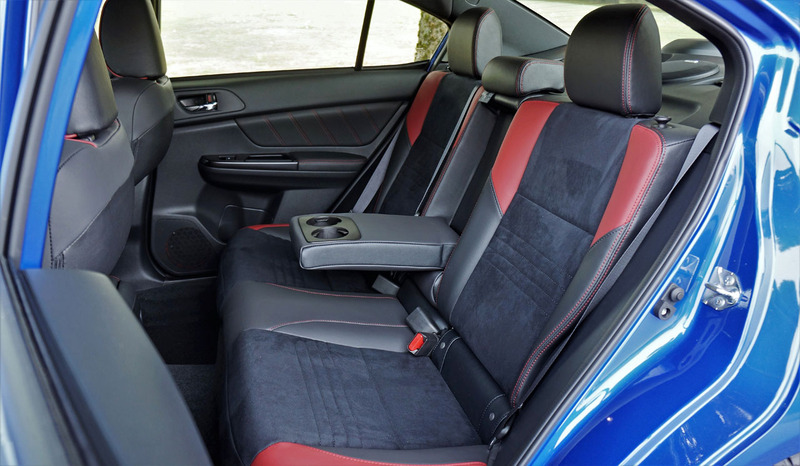 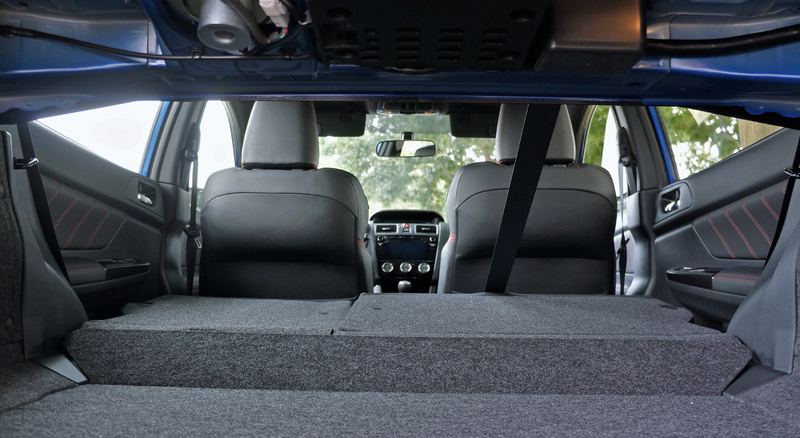 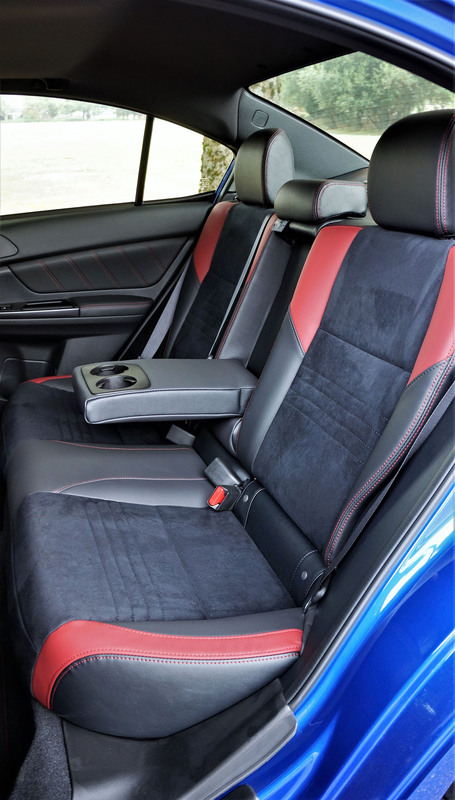 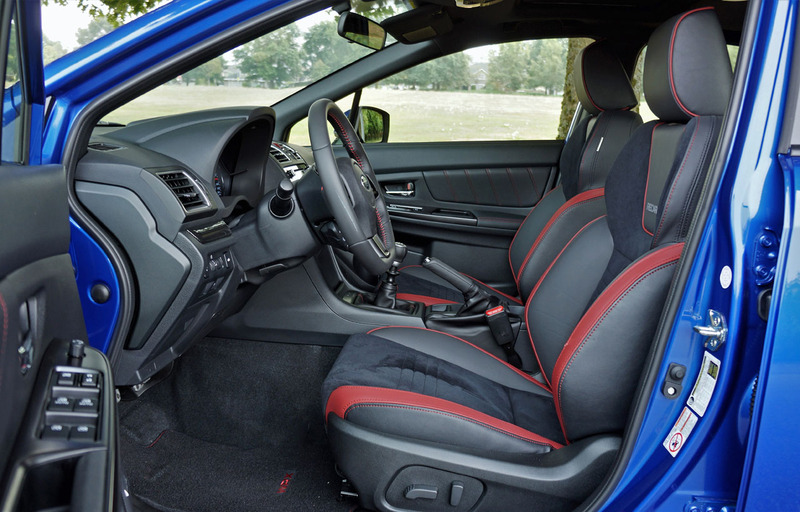 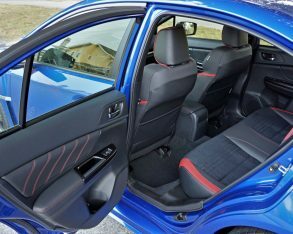 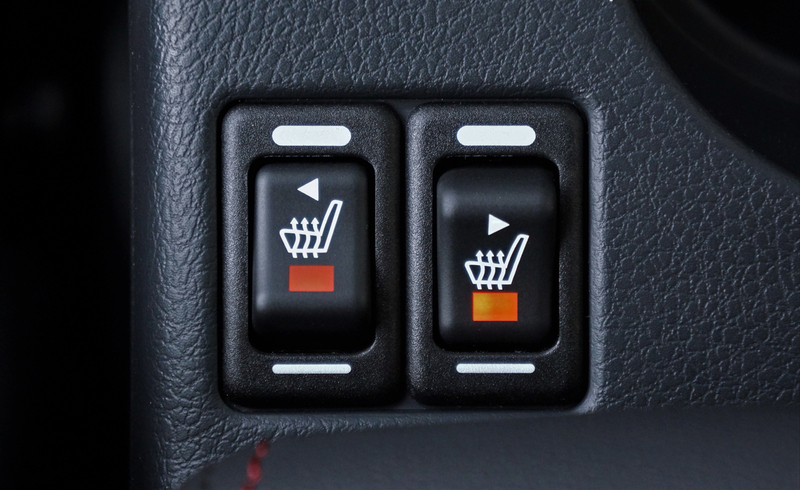 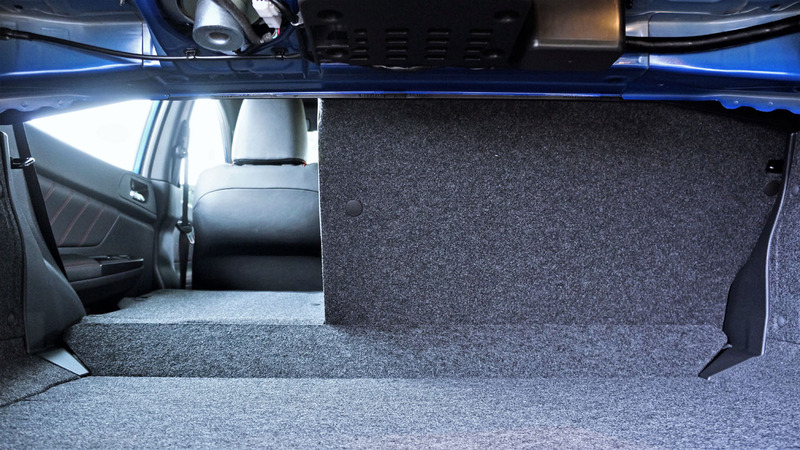 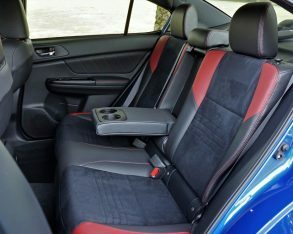 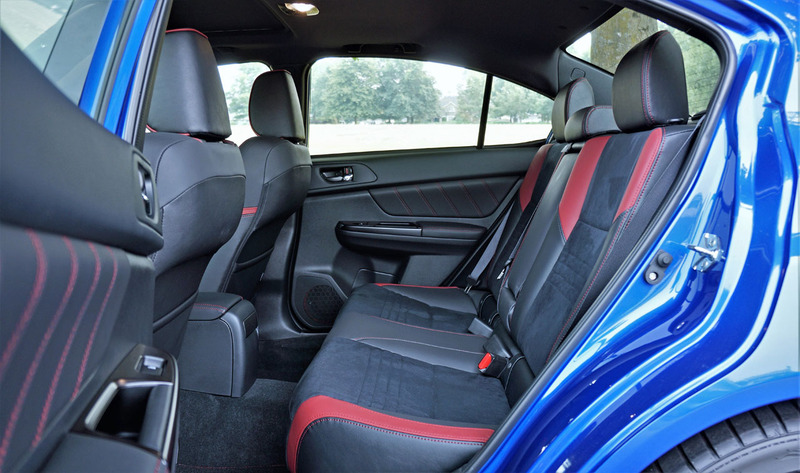 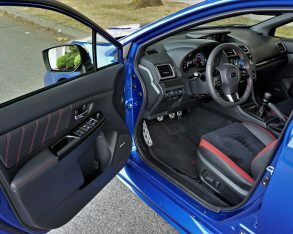 Additionally, rear passengers received a fold-down centre armrest with integrated cupholders, while all occupants benefited from reduced interior noise, a retuned suspension, and a stronger battery. 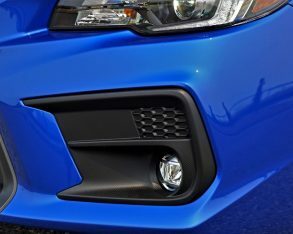 Styling specifics included a totally refreshed grille featuring new blackened borders and a black mesh insert, as well as a racing-spec-style multi-component lower front fascia with a matte black centre vent, not to mention larger reshaped matte black fog lamp bezels, while the entire package now rolls on an assortment of new dark alloy wheels depending on trim. 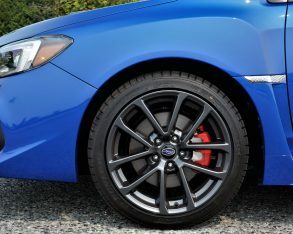 Base and Sport models were fitted with gunmetal grey-painted 15-spoke 17-inch alloys on 235/45 Dunlop SP Sport Maxx RT rubber, while as-tested Sport-tech trim received a larger set of twinned five-spoke 18-inch cast aluminum wheels on the same Dunlops measuring 245/40 front and rear, all of which carries over to 2019. 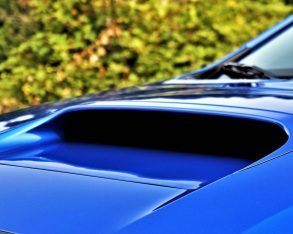 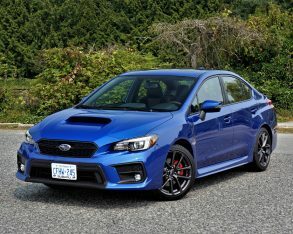 Likewise the massive hood scoop, coke-bottle fenders with integrated engine vents bearing chromed “WRX” appliques, subtle rear deck lip spoiler, and race-inspired matte black rear diffuser with quad chromed tailpipes were pulled forward into 2018 intact, and remain the same this year. 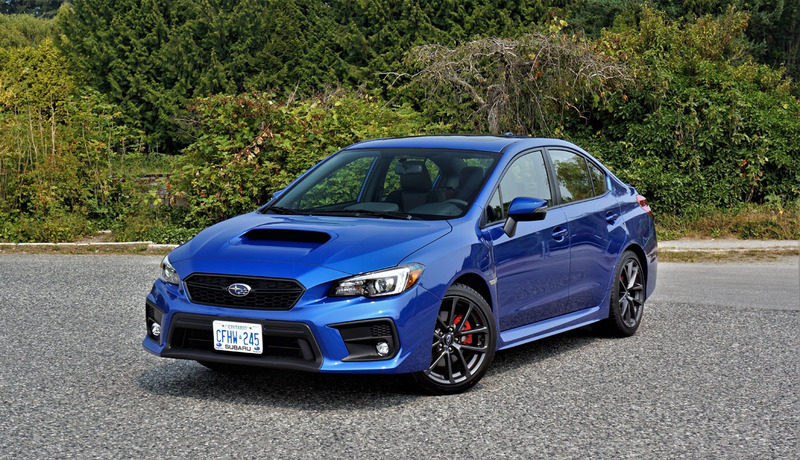 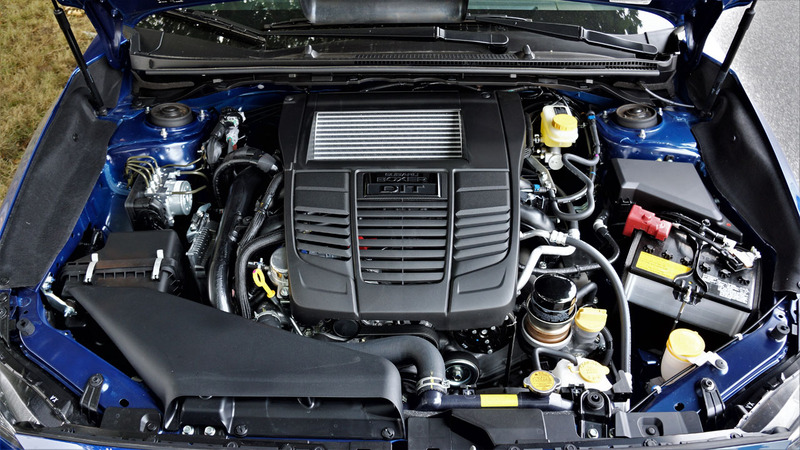 Also carryover, the non-STI WRX variants once again get Subaru’s 2.0-litre direct-injection twin-scroll turbocharged boxer four, making a considerable 268-horsepower and 258 lb-ft of torque. 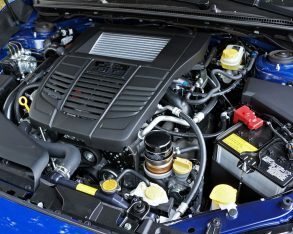 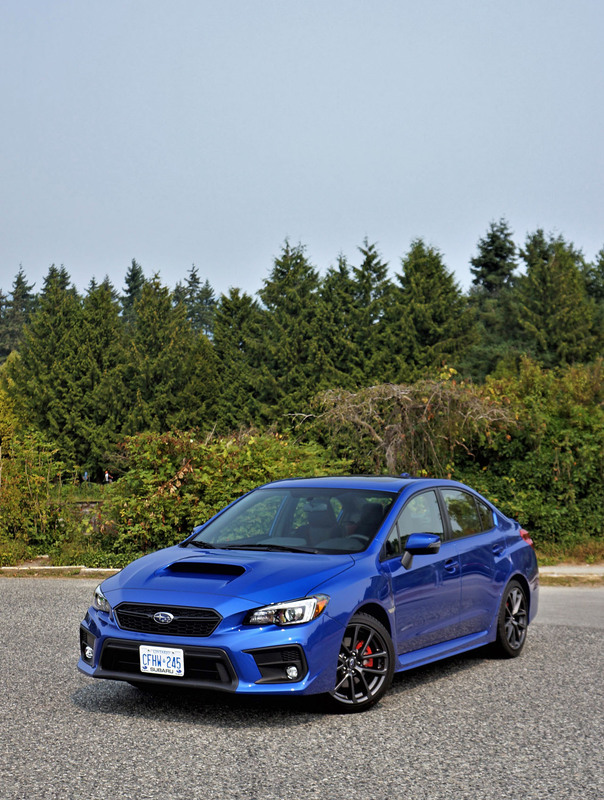 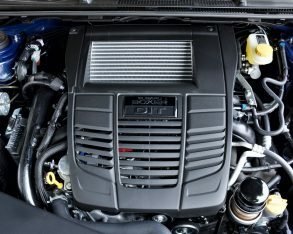 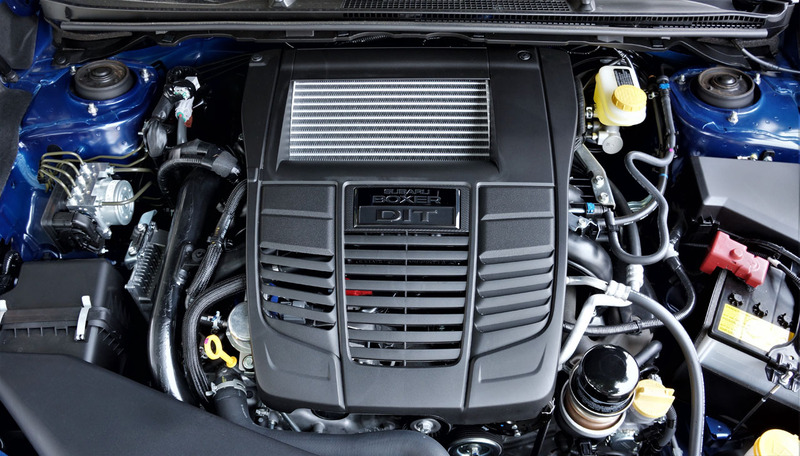 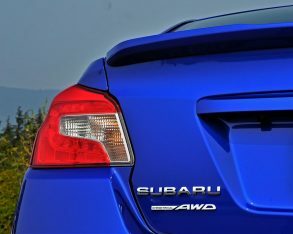 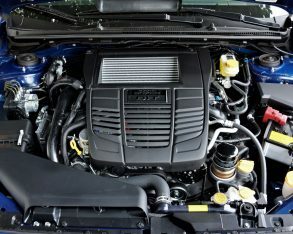 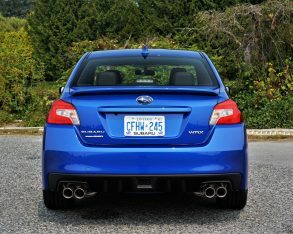 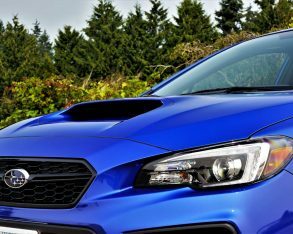 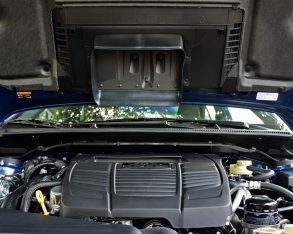 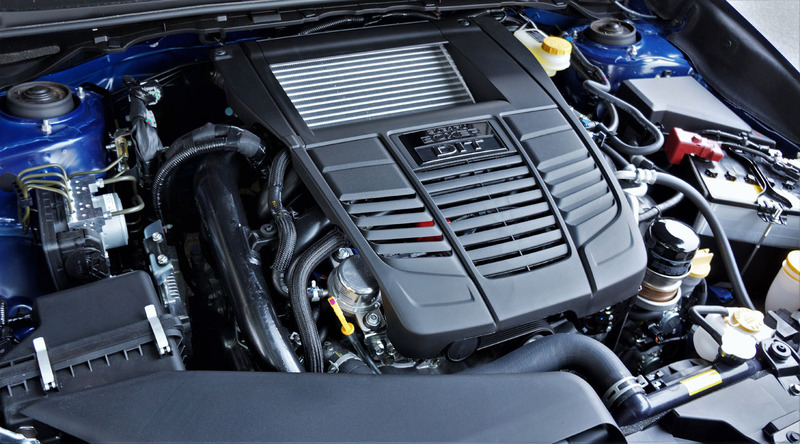 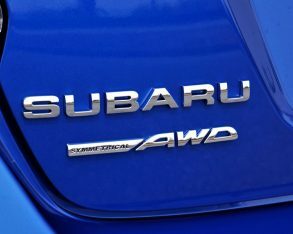 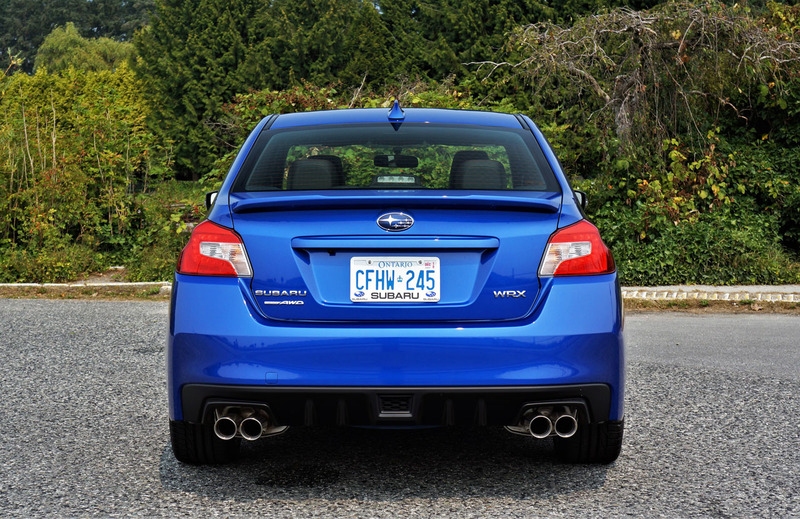 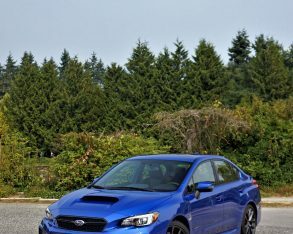 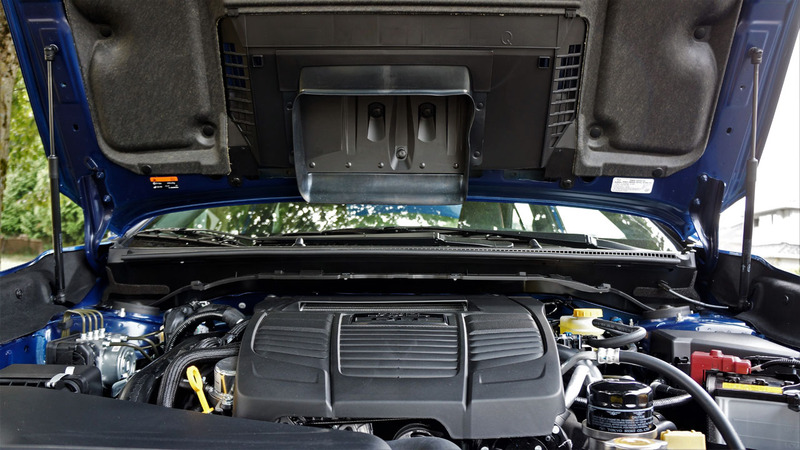 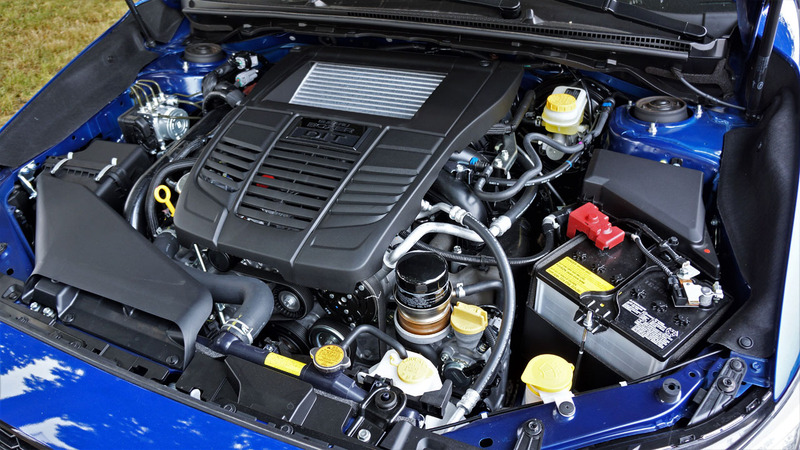 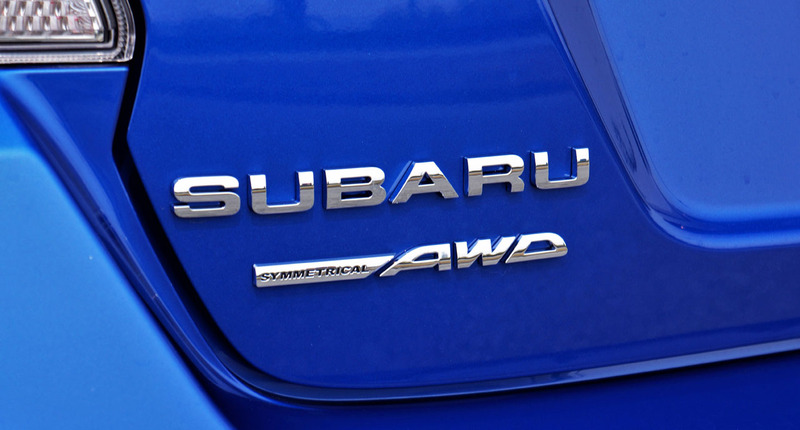 Of course the brand’s legendary Symmetrical-AWD comes standard, while connecting engine to driveline is a standard six-speed manual or optional Sport Lineartronic continuously variable transmission with steering wheel paddles, plus quick-shifting six- and eight-speed manual modes and Subaru Intelligent Drive (SI-DRIVE). 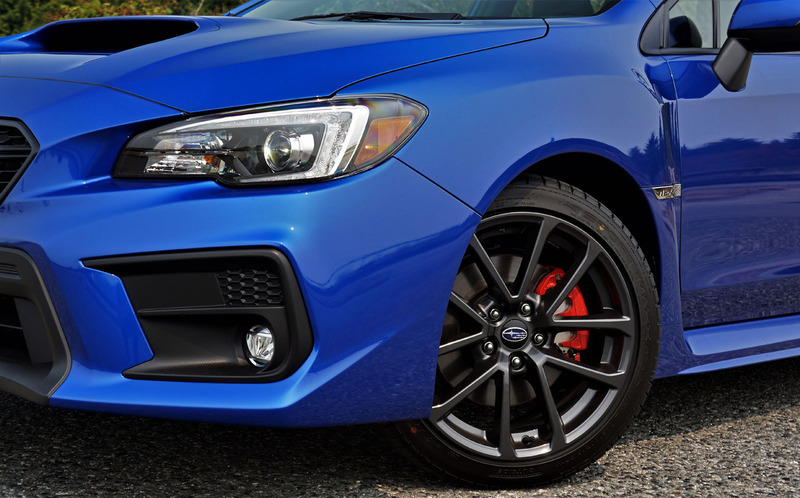 Some will find it hard to accept the words WRX and CVT being used in the same sentence let alone within the same car, but after testing it in 2017 we were impressed. 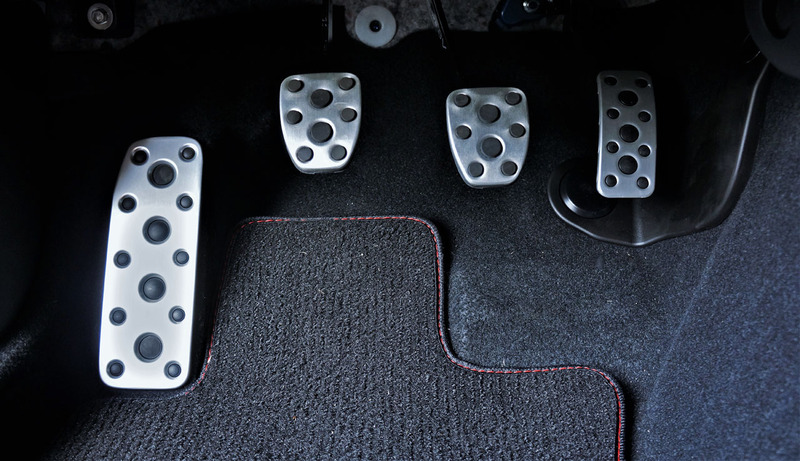 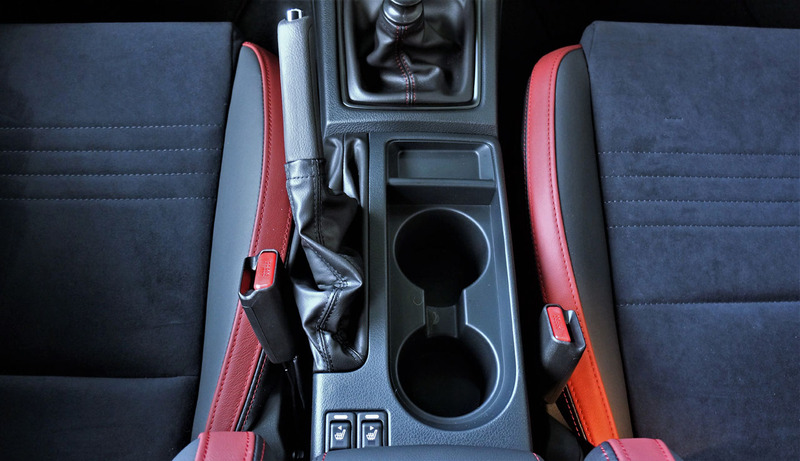 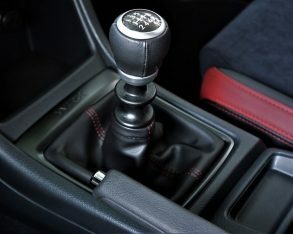 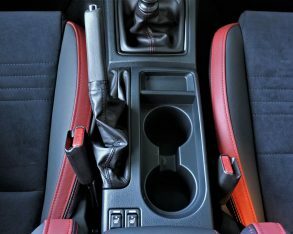 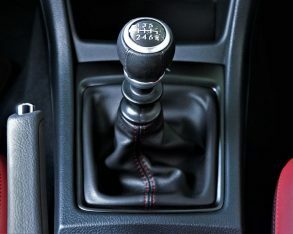 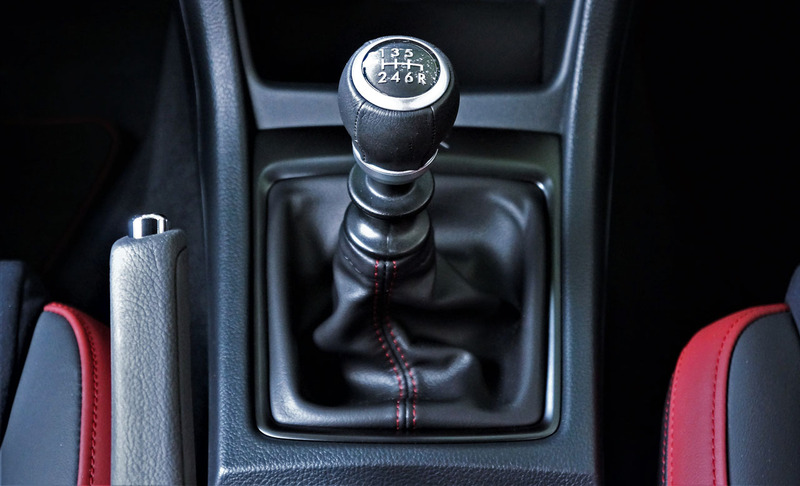 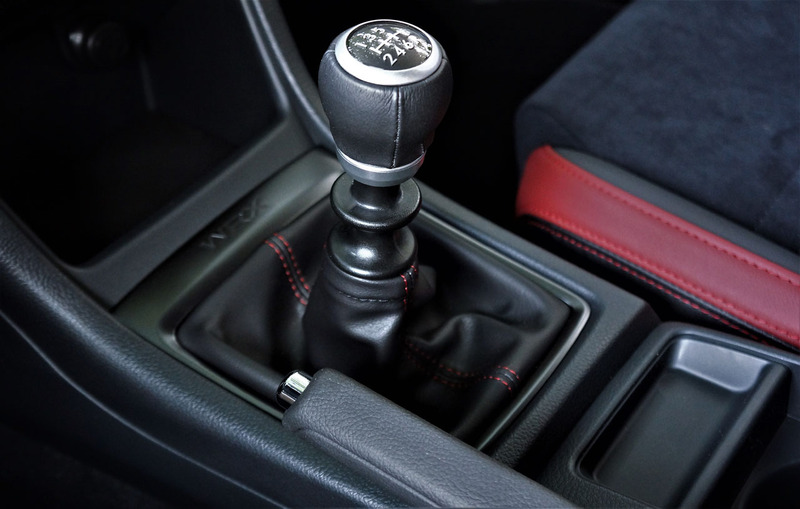 More important to WRX purists, the manual gearbox received a new shift lever along with improved shifter and clutch feel last year, so we’ll once again report on this in the upcoming review. 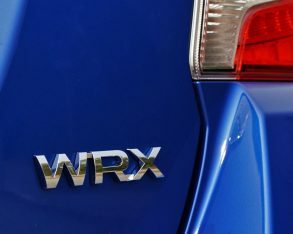 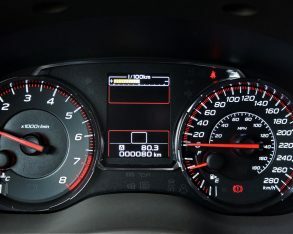 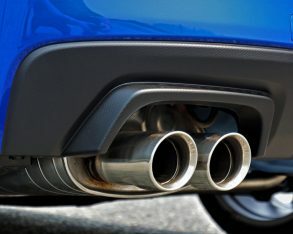 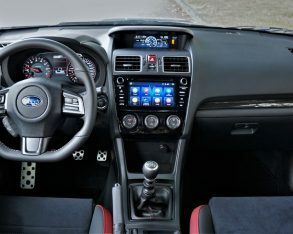 The WRX is quite efficient despite its potent performance with a claimed rating of 12.6 L/100km in the city, 9.6 on the highway and 11.2 combined when mated to its standard manual gearbox, or 11.3 city, 8.5 highway and 10.0 combined with the CVT, these numbers unchanged from last year. 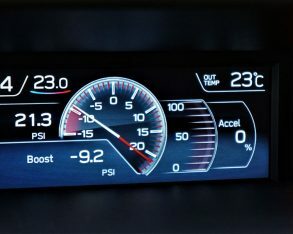 Straight-line performance is identical to the 2018 model too, with the manual still capable of 5.4 seconds from standstill to 100km/h, and the automatic good for 5.9 seconds, whereas the CVT actually beats the manual’s 232-km/h top speed by 8 km/h for a nice round total of 240. 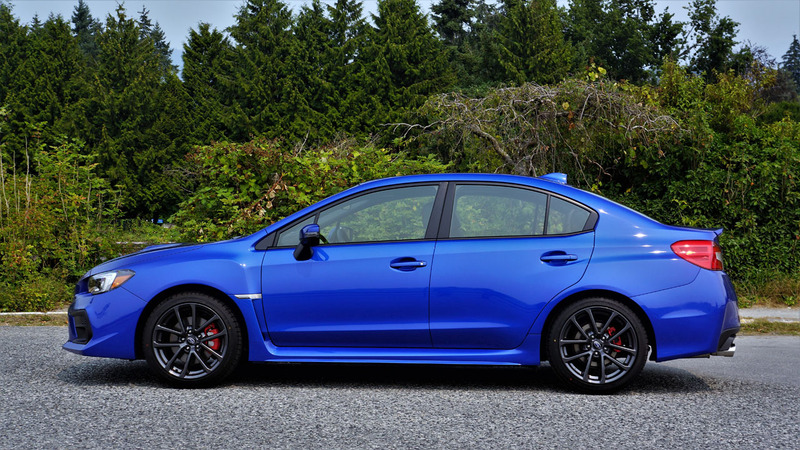 Something WRX fans of all stripes will appreciate is no changes in pricing from 2018 to 2019, meaning the base WRX continues forward with an MSRP of just $29,995, while Sport trim is priced at $33,195 and the Sport-tech at $36,495, the latter available with the as-tested manual-only RS package that was new last year and once again pulled into 2019 for an extra $2,300. 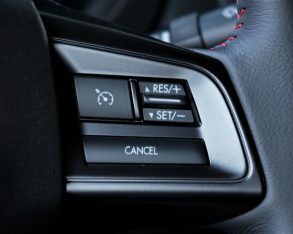 Alternatively, last year’s new $1,300 EyeSight upgrade remains solely available with the CVT, while that autobox adds $1,300 no matter which trim you choose it in. 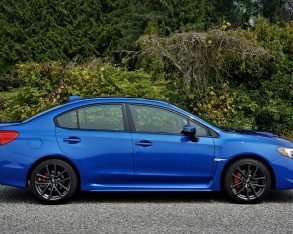 More powerful STI models excluded, the WRX Sport-tech with EyeSight is the most expensive WRX combination at $39,095 plus freight and fees, whereas my Sport-tech RS tester started at $38,795. 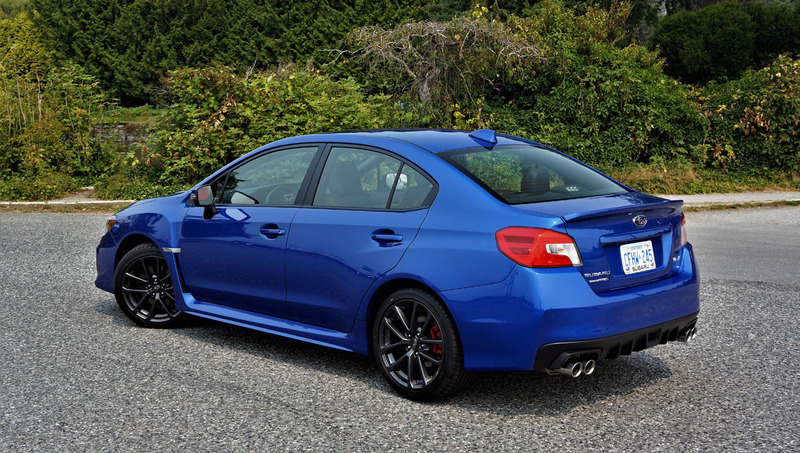 Something WRX fans of all stripes will appreciate is no changes in pricing from 2018 to 2019, meaning the base WRX continues forward with an MSRP of just $29,995, while Sport trim is priced at $33,195 and the Sport-tech at $36,495, the latter available with the as-tested manual-only RS package that was new last year and once again pulled into 2019 for an extra $2,300. 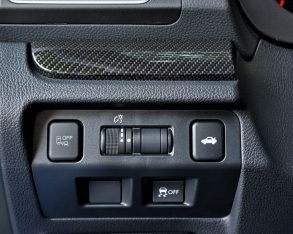 Alternatively, last year’s new $1,300 EyeSight upgrade remains solely available with the CVT, while that autobox adds $1,300 no matter which trim you choose it in. 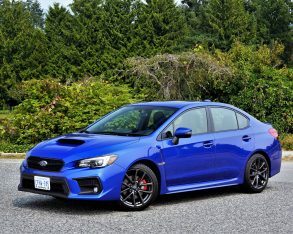 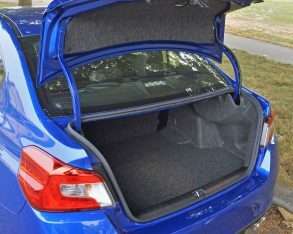 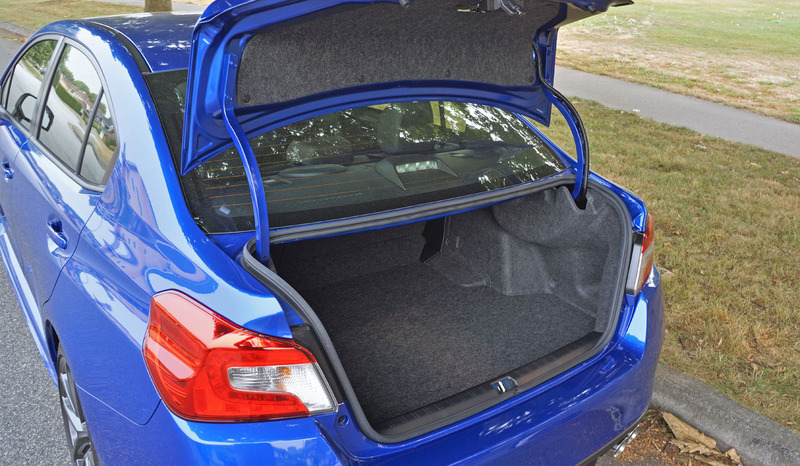 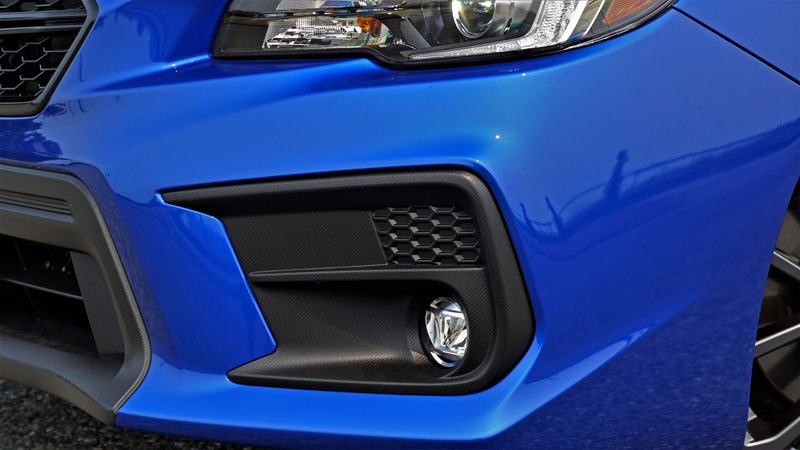 More powerful STI models excluded, the WRX Sport-tech with EyeSight was the most expensive WRX combination last year at $39,095 plus freight and fees, whereas my Sport-tech RS tester started at $38,795. 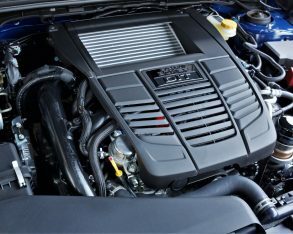 Second-most expensive? 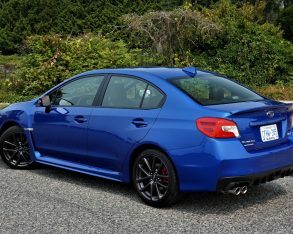 Yes, for 2019 Subaru has combined some of the STI’s styling features with regular WRX running gear in a new $40,995 雷雨 Raiu Edition that only comes in an exclusive Cool Grey Khaki colour. 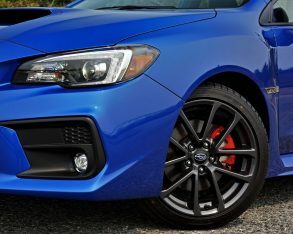 Its just noted STI-style exterior detailing includes a sharper front lip spoiler, extended side skirts and a large wing spoiler, plus 19-inch alloys framing the STI’s yellow-painted Brembo six-pot front and two-pot rear brake calipers over ventilated and cross-drilled rotors. 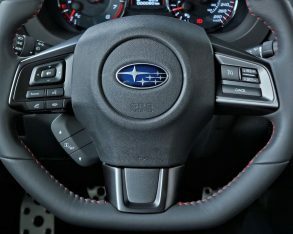 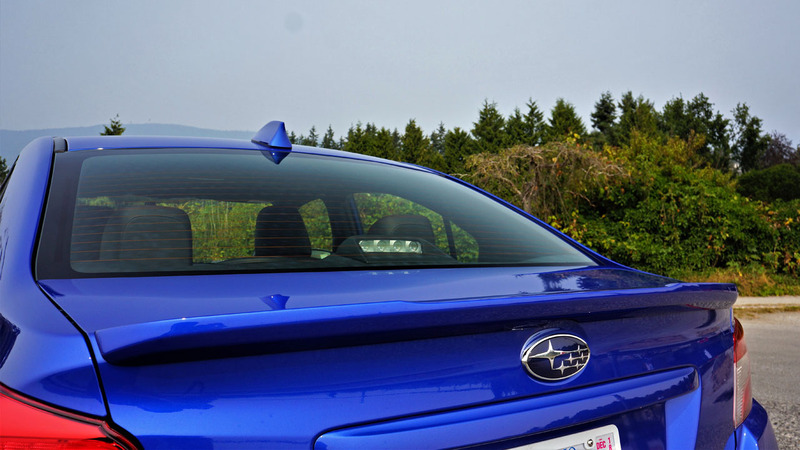 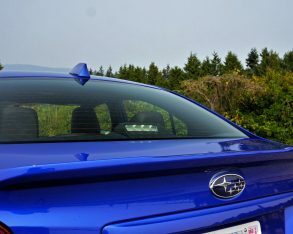 Additional 雷雨 Raiu Edition features include the Subaru Rear/Side Vehicle Detection System (SRVD) featuring blindspot monitoring with rear cross-traffic alert and lane change assist, a powered moonroof, a 10-way powered driver’s seat including powered lumbar support, and red seatbelts throughout. 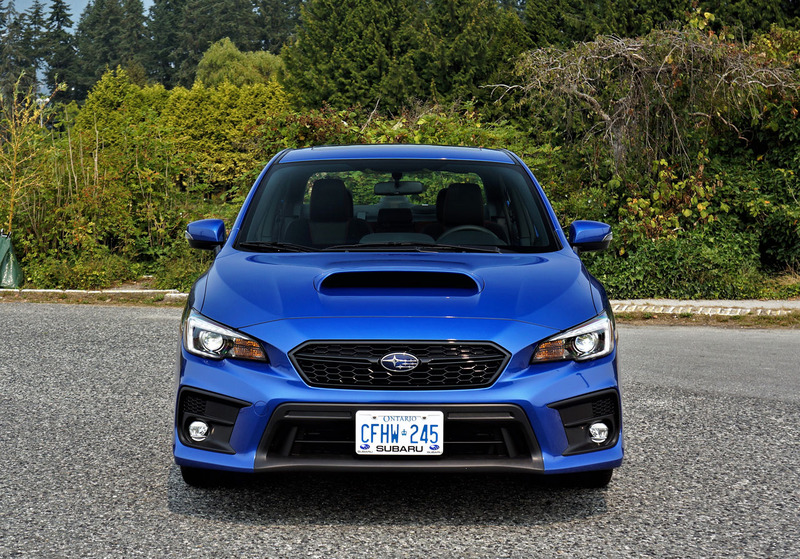 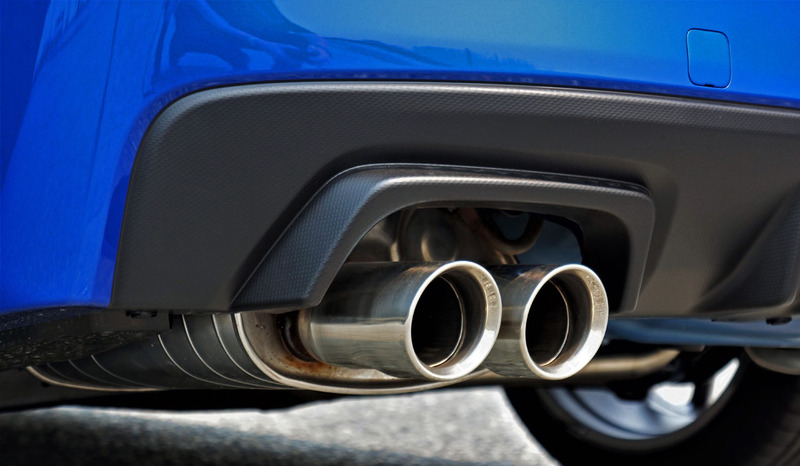 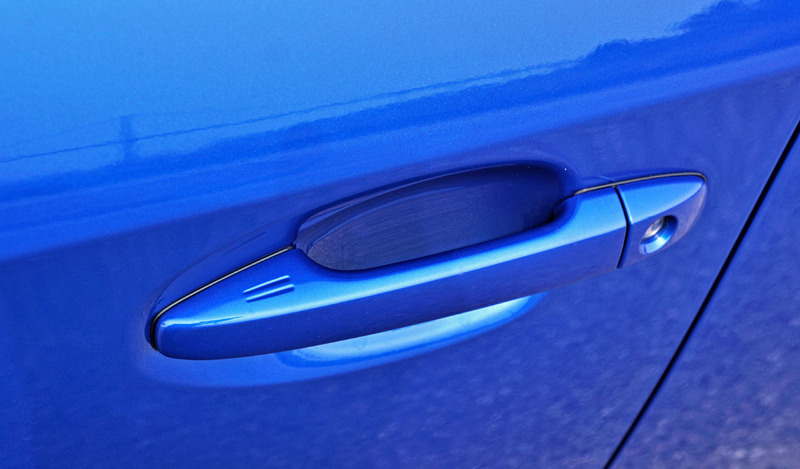 Incidentally, we sourced all trim, package and option pricing at CarCostCanada, where you’ll also find information about available rebates and otherwise hard to find dealer invoice pricing that could save you thousands. 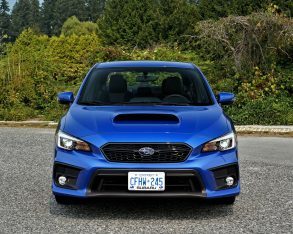 Last year I posed the WRX Sport-tech with EyeSight as the safest compact in its class, and I still feel the same thanks to its superb handling that allows for near unparalleled accident avoidance no matter the road or trail surface condition, this of course aided by its aforementioned all-wheel drivetrain with active torque vectoring, while it also gets multi-mode vehicle dynamics control, plus a full slate of standard active and passive safety features. 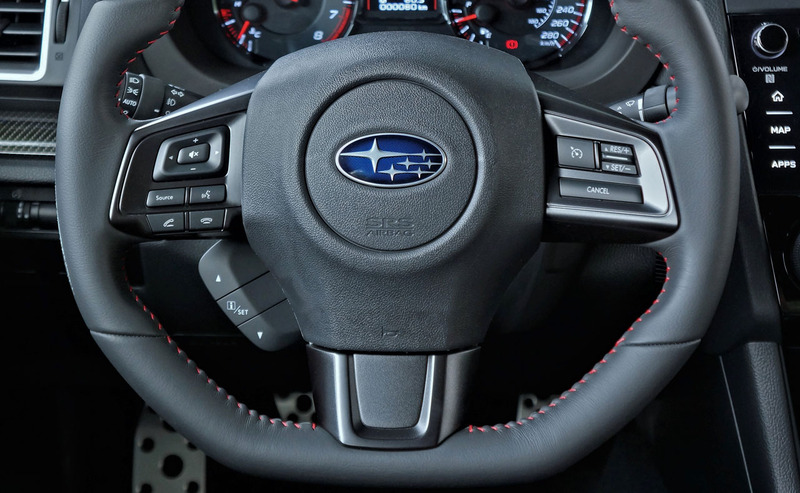 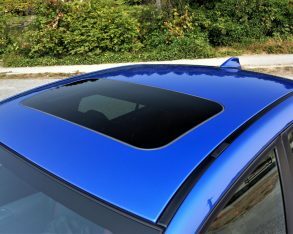 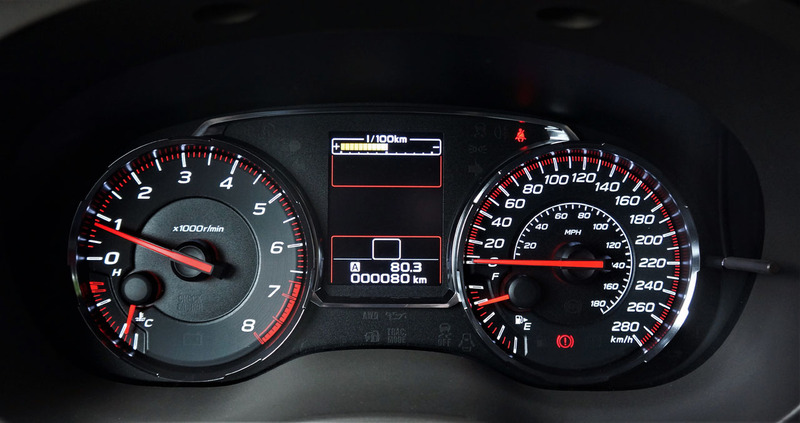 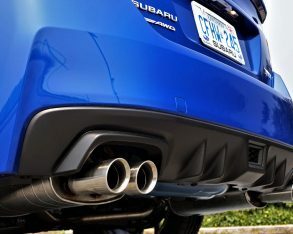 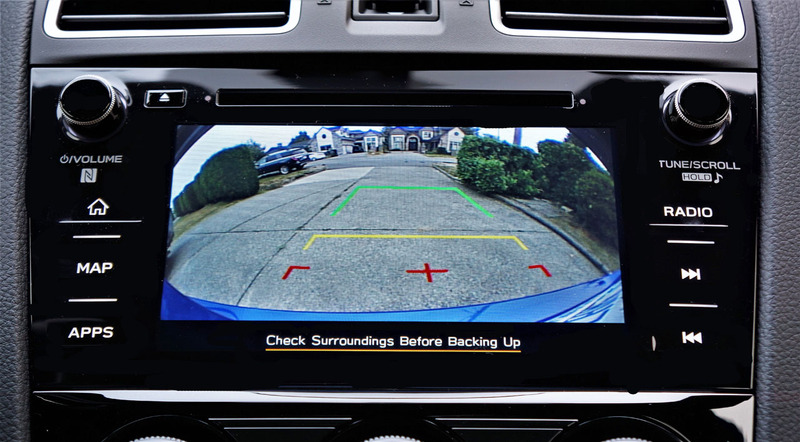 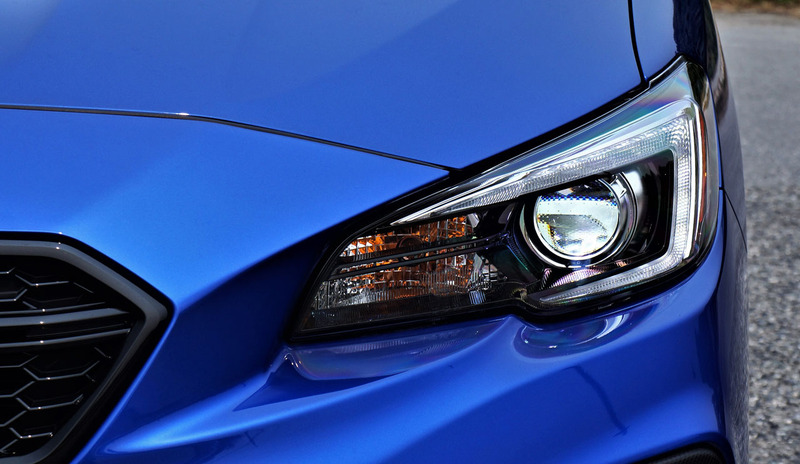 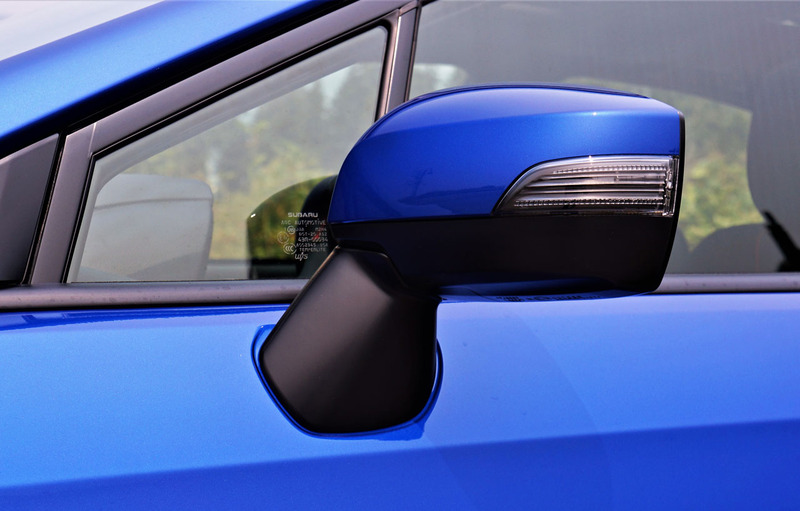 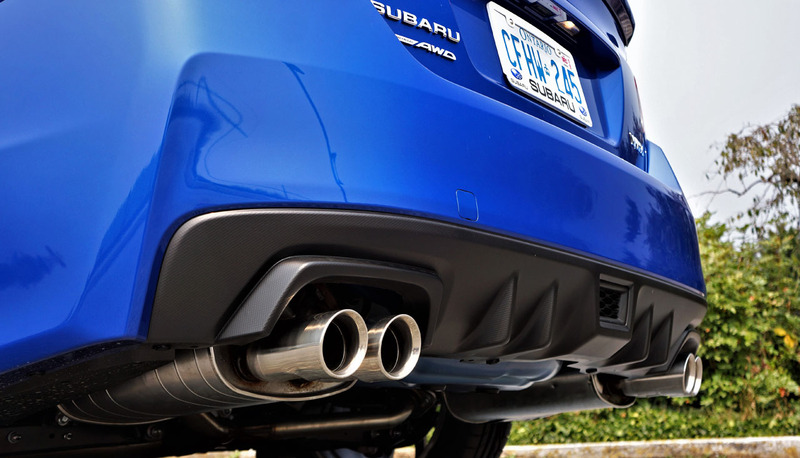 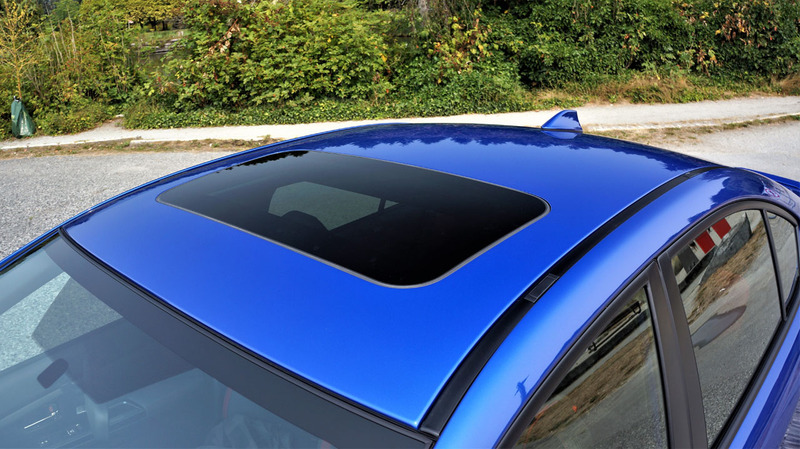 For Subie fans that are more safety- and convenience-oriented than purely out for performance, the just noted EyeSight package adds automatic high beams, adaptive cruise control, lead vehicle start alert, pre-collision braking, pre-collision brake assist, pre-collision throttle management, reverse automatic braking, lane departure warning, lane sway warning, and lane keeping assist. 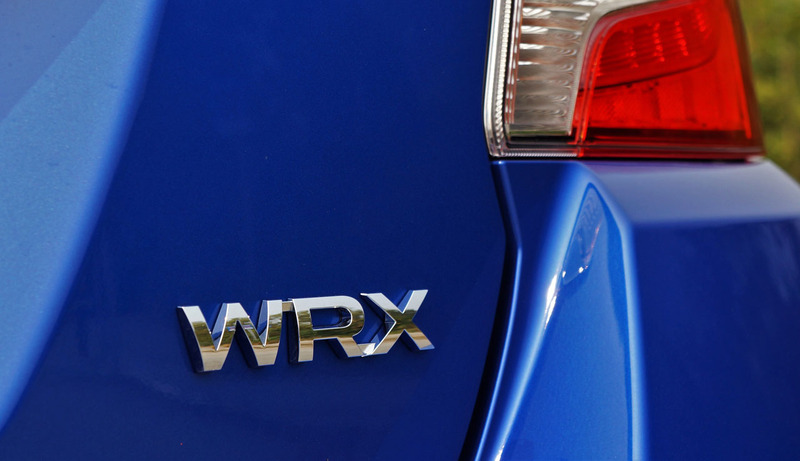 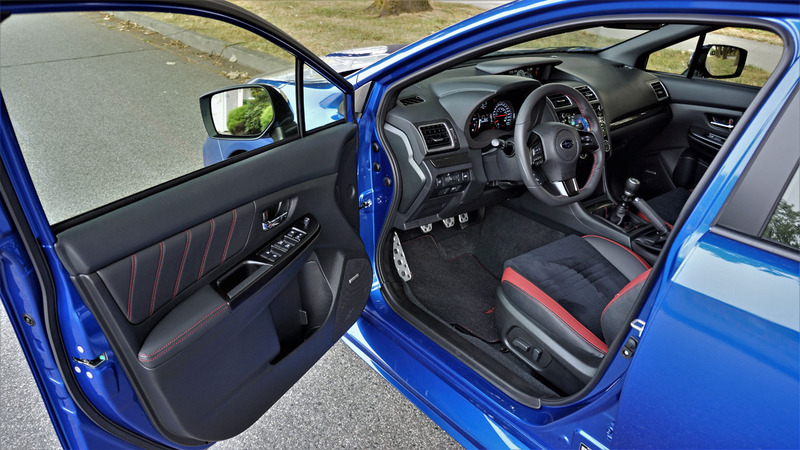 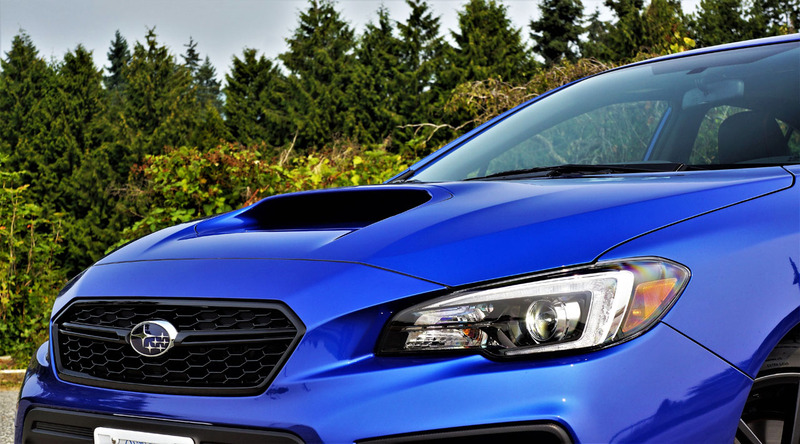 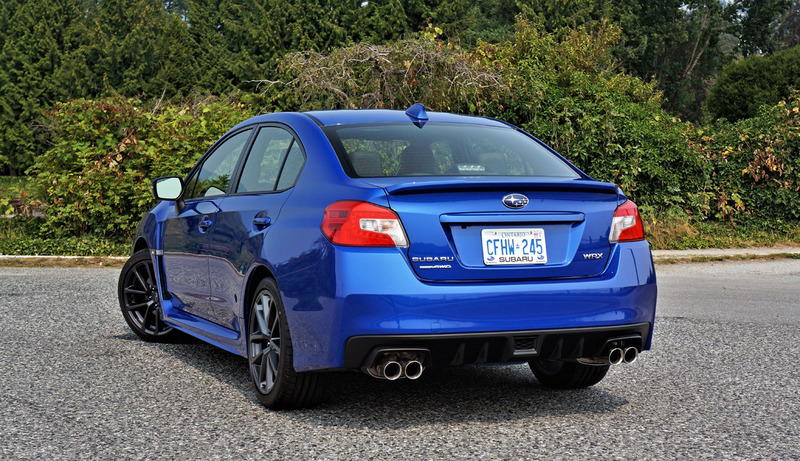 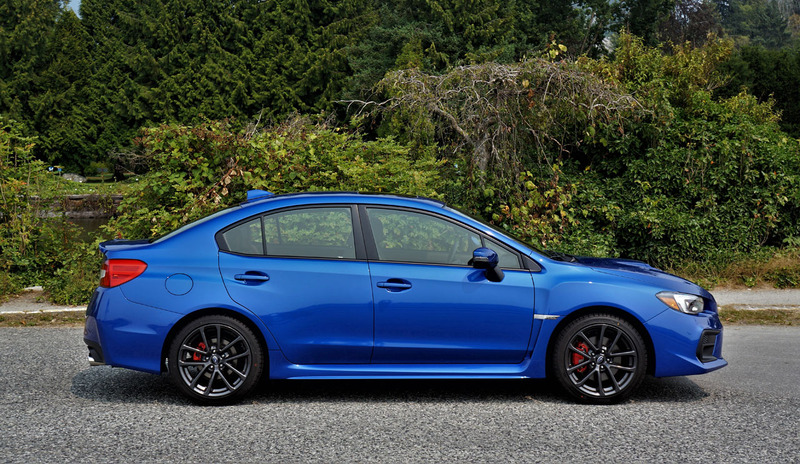 So equipped the WRX earns a best-possible IIHS Top Safety Pick Plus rating. 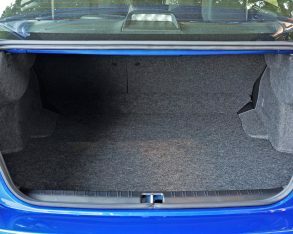 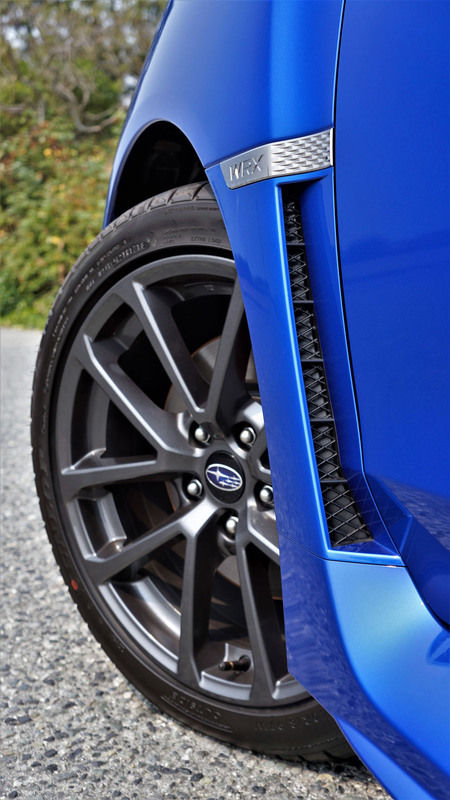 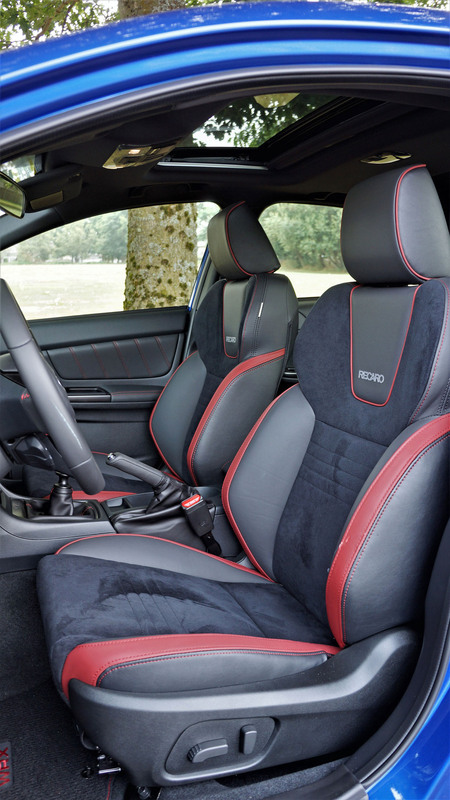 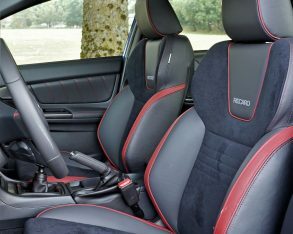 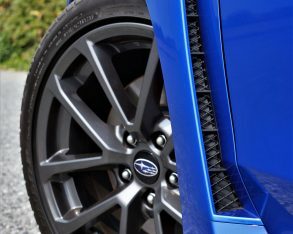 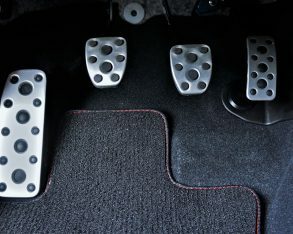 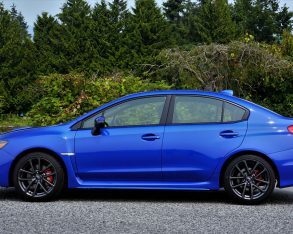 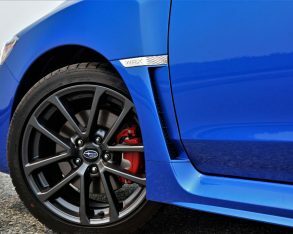 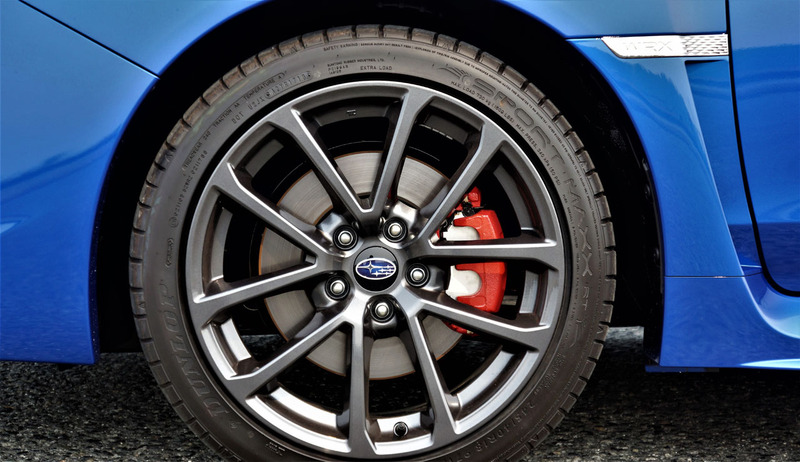 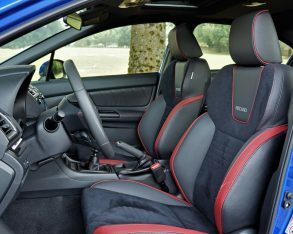 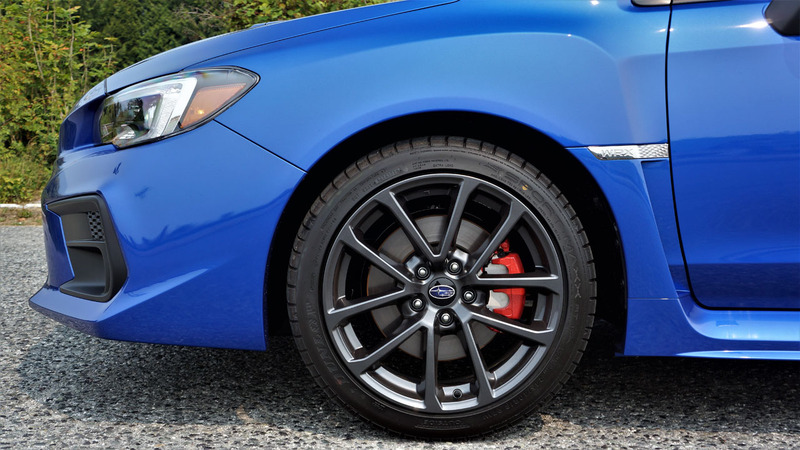 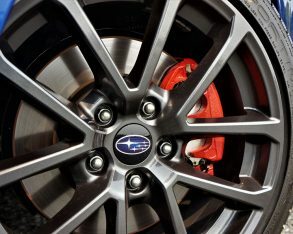 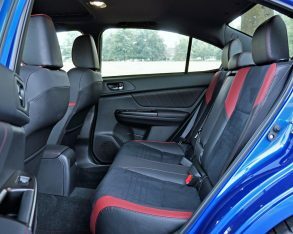 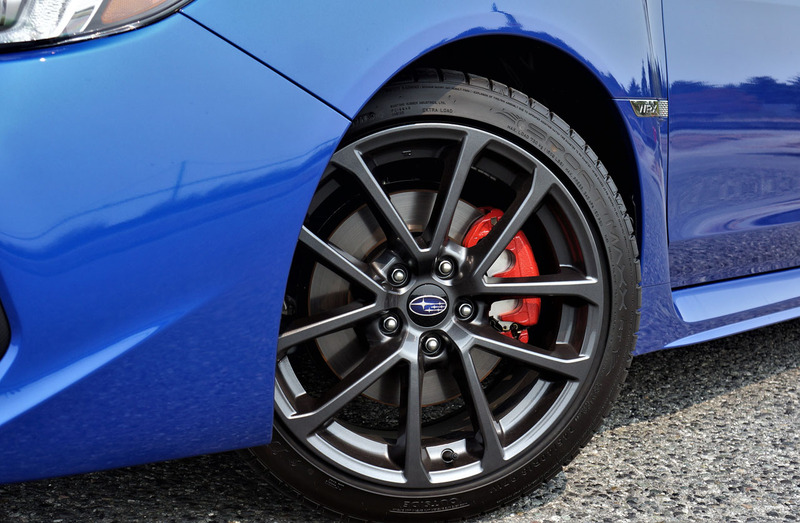 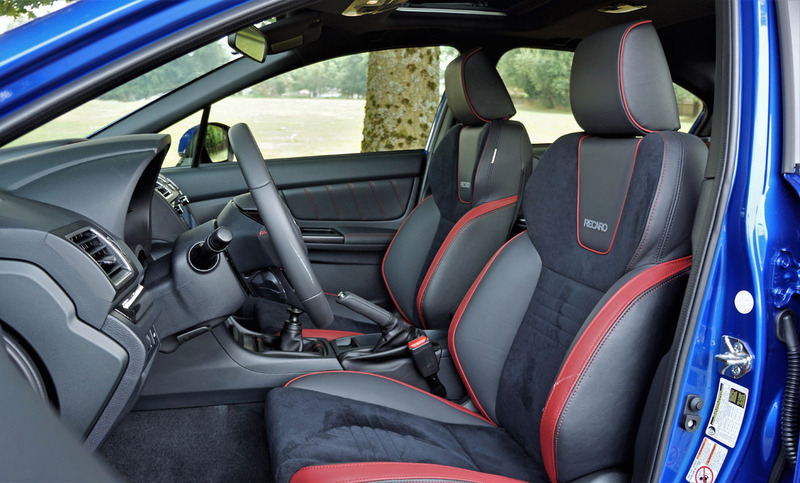 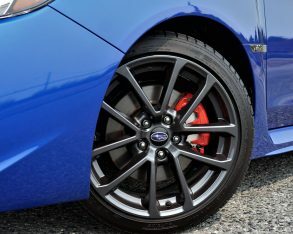 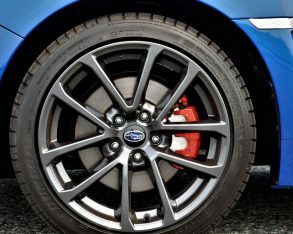 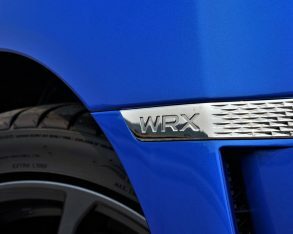 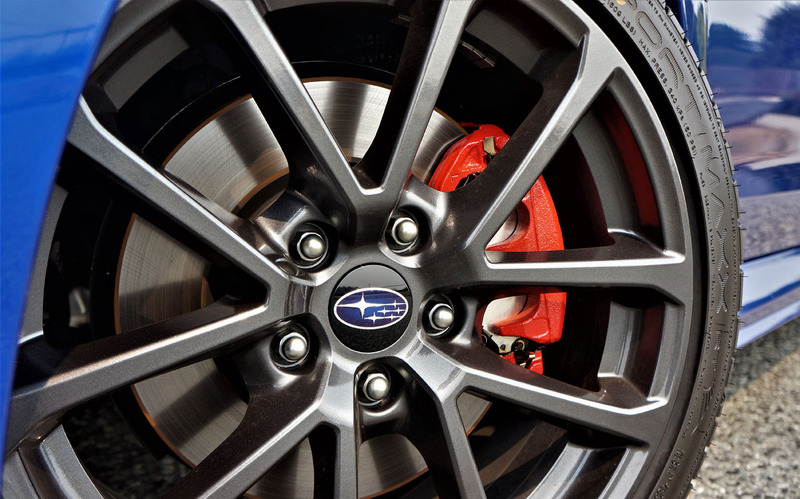 As for the WRX Sport-tech RS on this page, uprated Jurid brake pads clamp down on a standard set of 316 mm front and 286 mm rear rotors via red brake calipers, while the interior gets luxurious black and red partial-leather/ultrasuede upholstery, the driver’s perch downgraded from 10-way power to just eight adjustments due to much more inherently supportive Recaro sport seats. 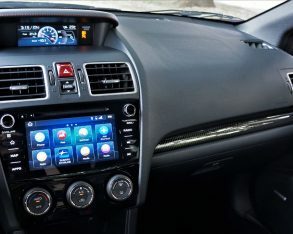 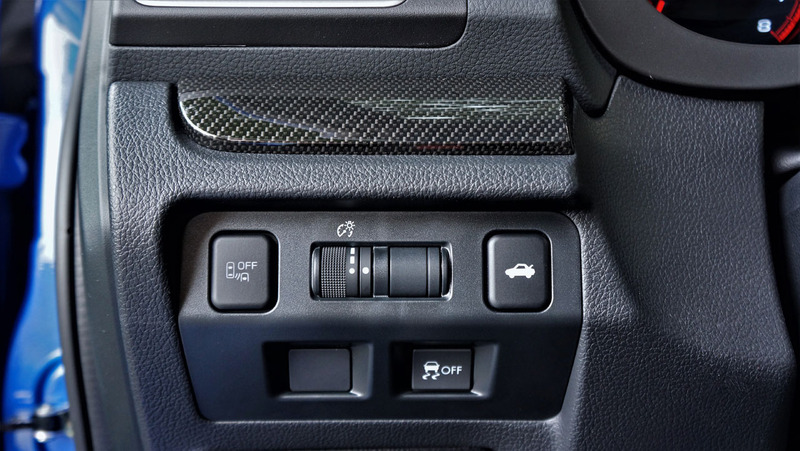 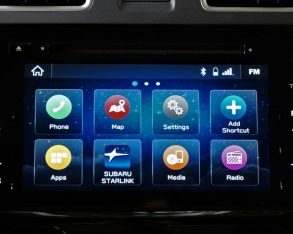 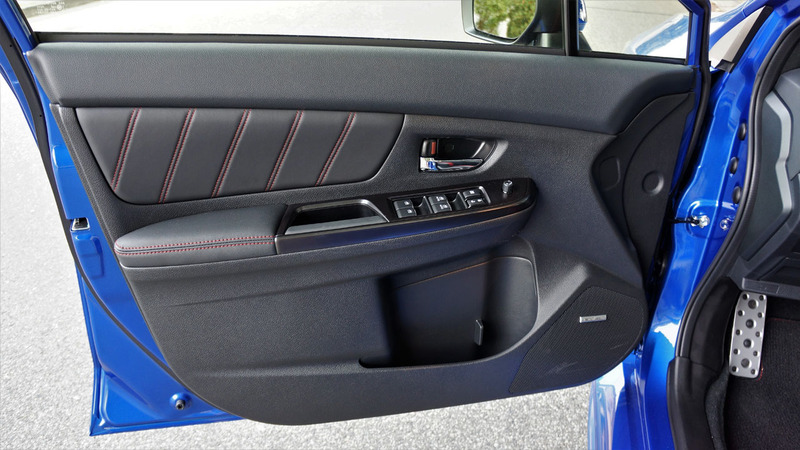 Additionally, my tester’s Sport-tech trim added proximity-sensing keyless access with pushbutton ignition, the larger 7.0-inch touchscreen filled with updated system graphics noted earlier, Subaru’s StarLink app, additional apps such as Yelp, Best Parking, Glympse, plus SiriusXM Traffic and Travel Link with weather, sports and stock market info, as well as a 320-watt nine-speaker Harman/Kardon audio system with two USB ports. 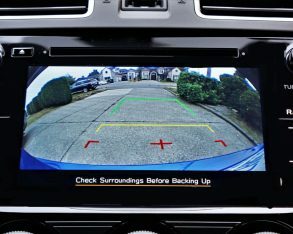 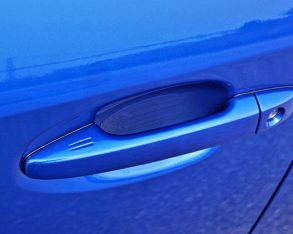 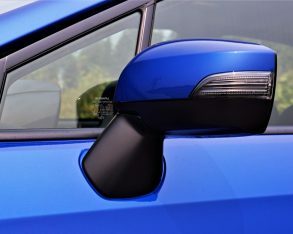 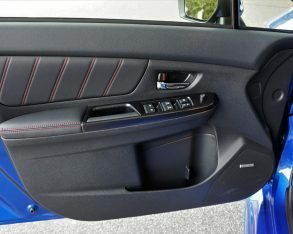 Features pulled up from Sport trim include wiper-integrated automatic LED headlights with new steering-responsive cornering, LED fog lamps, LED turn signals integrated into the side mirror caps, welcome lighting, a rear deck lid spoiler, a 10-way powered driver’s seat, a powered glass sunroof, and the aforementioned SRVD blindspot safety upgrade. 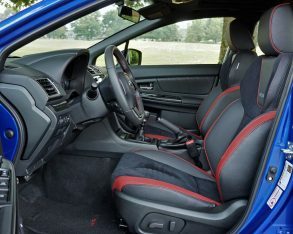 Lastly, features pulled up to Sport-tech trim from the base model include a quad-tipped high-performance exhaust system, integrated roof rack brackets, a windshield wiper de-icer, a leather-wrapped and red-stitched multifunction flat-bottom sport steering wheel, single-zone automatic climate control, heatable front seats, StarLink smartphone integration (including Aha radio), a backup camera, AM/FM/CD/MP3/WMA radio, satellite radio, Bluetooth phone connectivity with audio streaming, aux and USB ports, voice activation, and more.